On November 16, 2017, FDA released four guidance documents that, together, the Agency described as a “comprehensive policy framework” for applying existing laws and regulations governing regenerative medicine products, including human cells, tissues, and cellular and tissue-based products (“HCT/Ps”). The policy framework is set forth in a series of four guidance documents (two final, two draft) that build upon the regulatory framework for these products, which was completed in 2005. A guidance document cannot alter a regulation, but can clarify how FDA intends to enforce the regulation. In a statement from Commissioner Gottlieb (available here), FDA describes a balancing act in which it hopes to foster new and innovative treatment options for patients, while creating a clearer regulatory framework that will allow for greater enforcement ability against those that fall outside of the framework. Expedited Programs for Regenerative Medicine Therapies for Serious Conditions (“Expedited Programs for RMAT”). Evaluation of Devices Used with Regenerative Medicine Advanced Therapies (“Devices Used with RMAT”). Regulatory Considerations for Human Cell, Tissues, and Cellular and Tissue-Based Products: Minimal Manipulation and Homologous Use—Guidance for Industry and Food and Drug Administration Staff (November 2017) (“Regulatory Considerations Guidance”). Same Surgical Procedure Exception under 21 CFR 1271.15(b): Questions and Answers Regarding the Scope of the Exception—Guidance for Industry (November 2017) (“SSP Guidance”). FDA regulations at 21 C.F.R. Part 1271, previous draft guidance documents, and untitled letters establish the Agency’s approach to regulating HCT/Ps. In short, some HCT/Ps are exempt from premarket approval and are subject to regulation solely under section 361 of the Public Health Service Act (“PHS Act”) (so‑called “361 HCT/Ps”) whereas others require premarket approval (i.e., as a drug, device, or biologic) (so‑called “351 HCT/Ps”). Both 361 HCT/Ps and 351 HCT/Ps are subject to FDA requirements (at Part 1271) for registration and listing, donor-eligibility, current good tissue practices, and other requirements intended to prevent transmission of communicable diseases. Still others – those that are the subject of the “same surgical procedure” exception – are exempt from both premarket approval requirements and the requirements of Part 1271. (This regulatory regime is outlined at the end of this blog post in a flow chart, which is one of the few new features of the final guidance documents). The two final guidance documents largely reiterate FDA’s existing approach to regulating HCT/Ps, including the Agency’s interpretation of “minimal manipulation,” “homologous use,” and the “same surgical procedure” exception, and they provide additional examples to illustrate FDA’s interpretations. Together these two guidance documents finalize and consolidate four draft guidance documents: “Same Surgical Procedure Exception under 21 CFR 1271.15(b): Questions and Answers Regarding the Scope of the Exception” (October 2014) (“Draft SSP Guidance”); “Minimal Manipulation of Human Cells, Tissues, and Cellular and Tissue-Based Products (HCT/Ps)” (December 2014); “Homologous Use of Human Cells, Tissues, and Cellular and Tissue-Based Products (HCT/Ps)” (October 2015); and “Human Cells, Tissues, and Cellular and Tissue-Based Products (HCT/Ps) from Adipose Tissue: Regulatory Considerations” (December 2014). The guidance document “Minimal Manipulation of Structural Tissue Jurisdictional Update” (September 2006) is now considered superseded. This guidance document finalizes FDA’s standing approach with regard to two key factors in determining whether a product is exempt from premarket approval: i.e., whether the HCT/P is only “minimally manipulated” and whether it is intended for “homologous use.” It does not change the Agency’s fundamental approach to these issues, but it does provide a number of additional examples to illustrate FDA’s approach, and relatively minor clarifications that were not included in earlier draft guidance documents. Interestingly, although FDA has not changed its basic approach to regulating HCT/Ps, the Agency intends to exercise enforcement discretion for 36 months with regard to 351 HCT/Ps requiring premarket approval. 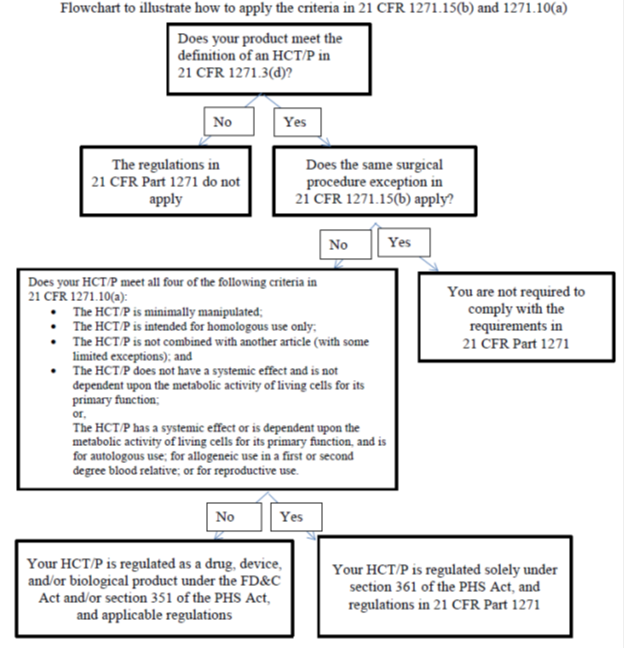 The guidance states that, in order to “give manufacturers time to determine if they need to submit an IND or marketing application in light of this guidance,” FDA intends to exercise enforcement discretion (i.e., the Agency may permit marketing without an approved marketing application) if the HCT/P “is intended for autologous use and its use does not raise reported safety concerns or potential significant safety concerns.” Regulatory Considerations Guidance at 21. FDA intends to focus enforcement actions on “products with higher risk,” taking into account factors such as non‑autologous (allogeneic) use, the route of administration, the site of administration, and whether the product is intended for homologous or non-homologous use. For example, HCT/Ps administered via intravenous injection or infusion, aerosol inhalation, intraocular injection, or injection or infusion into the central nervous system, will be prioritized over HCT/Ps administered by intradermal, subcutaneous, or intra-articular injection. Id. Similarly, HCT/Ps intended for non-homologous use, particularly those intended to treat serious or life-threatening conditions, “are more likely to raise significant safety concerns than HCT/Ps intended for homologous use . . . .” Id. at 21-22. Earlier draft guidance explained that different “minimal manipulation” criteria apply to structural tissue versus cellular/nonstructural tissue. The final guidance states that although FDA “acknowledges that some manufacturers assert that an HCT/P has both a structural and cellular/nonstructural function[,] . . . under the regulations, HCT/Ps are considered either structural tissues or cells/nonstructural tissues.” Id. at 7. The final guidance provides additional examples to illustrate the application of the “minimal manipulation” criteria to structural tissue (e.g., grinding fascia lata; removal of cells from structural tissue; storage in a buffer solution; cryopreservation and storage in liquid nitrogen vapor). Id. at 10-12. The final guidance clarifies that, although secreted body fluids are, by regulation, generally not HCT/Ps, cells from secreted body fluids are. Id. at 14. FDA regulations define “homologous use,” in part, as the “same basic function or functions in the recipient as in the donor.” 21 C.F.R. § 1271.3(c). The final guidance explains that “By ‘basic’ we mean the function or functions that are commonly attributed to the HCT/P as it exists in the donor. Basic functions are well understood; it should not be necessary to perform laboratory, pre-clinical, or clinical studies to demonstrate a basic function or functions for the purpose of applying the HCT/P regulatory framework. Also, clinical effects of the HCT/P in the recipient that are not basic function or functions of the HCT/P in the donor would generally not be considered basic function or functions of the HCT/P for the purpose of applying the definition of homologous use.” Regulatory Considerations Guidance at 16-17. Under 21 C.F.R. § 1271.15(b), an establishment that “removes HCT/P’s from an individual and implants such HCT/P’s into the same individual during the same surgical procedure” is exempt from both the premarket approval requirements and the requirements of Part 1271. An October 2014 draft guidance (the Draft SSP Guidance) provided FDA’s interpretation of this “same surgical procedure” (“SSP”) exception. The final SSP Guidance provides some additional examples to illustrate the policies outlined in the October 2014 draft guidance of the same name (and in other related guidance documents listed above). With one exception, described in the third bullet below, the underlying policies of the October 2014 draft guidance have not changed. What types of procedures may an establishment perform on an HCT/P and still maintain the SSP exception? FDA previously stated that “rinsing, cleansing, or sizing, or certain manufacturing steps” to process the HCT/P after removal and before reimplantation are generally permitted because they “raise no additional risks of contamination and communicable disease transmission beyond that typically associated with surgery.” Draft SSP Guidance at 3. The final guidance reiterates this position and provides additional examples of procedures that may be performed on an HCT/P as part of the SSP: these include “rinsing and cleansing by centrifugation or filtration solely to remove debris (e.g., lipids, blood, bone particles).” SSP Guidance at 7. In addition, certain “sizing and shaping” procedures would also be permitted, such as “dilatation to size a vascular graft in coronary artery bypass graft surgery, cutting parathyroid tissue into pieces appropriately sized for reimplantation, and meshing of skin grafts to facilitate shaping and sizing to cover cutaneous burn wounds.” Id. at 8. On the other hand, an HCT/P that undergoes centrifugation or filtration intended for “cell isolation, cell expansion, cell activation, or enzymatic digestion” would not qualify for the SSP exception. Id. at 7. Are there any procedures consisting of more than a single operation that are considered the same surgical procedure? FDA previously stated that, generally, a procedure that consists of multiple operations generally would not qualify for the SSP exception. However, FDA acknowledged that there may be limited circumstances in which surgical procedures performed a number of days apart may be considered the same surgical procedure, provided that no processing or manufacturing activities (beyond rinsing, cleansing, sizing, and storing) are performed on the HCT/P in the interim (e.g., craniotomy with subsequent implantation of the bone flap to reverse the cranial defect; parathyroidectomy with subsequent implantation of a portion of the tissue to preserve parathyroid function). Draft SSP Guidance at 4. The final guidance reiterates this interpretation. It does not provide additional examples beyond the craniotomy, craniectomy, or parathyroidectomy examples described above. It does, however, state that preservation techniques applied to the HCT/P between procedures, including “disinfecting or cryopreserving,” would not render the cranial bone flap or parathyroid tissue ineligible for the SSP exception. SSP Guidance at 6. Can an establishment that ships an HCT/P to another establishment before reimplantation qualify for the SSP exception? FDA previously said no: “Shipping the HCT/P to another establishment for implantation [or for temporary storage] raises safety concerns, such as contamination and cross-contamination, beyond those typically associated with surgery.” Draft SSP Guidance at 4. Regulatory Considerations Guidance at 5.